The term Pygmies refers to a number of peoples in central Africa who share two characteristics. Most of them are quite short, and they live by HUNTING AND GATHERING in forests. Since ancient times, both Africans and outsiders have recognized Pygmies as distinct from other people on the continent. Anthropologists do not know whether the peoples called Pygmies are a true racial group or whether they are racially the same as their non-Pygmy neighbors. 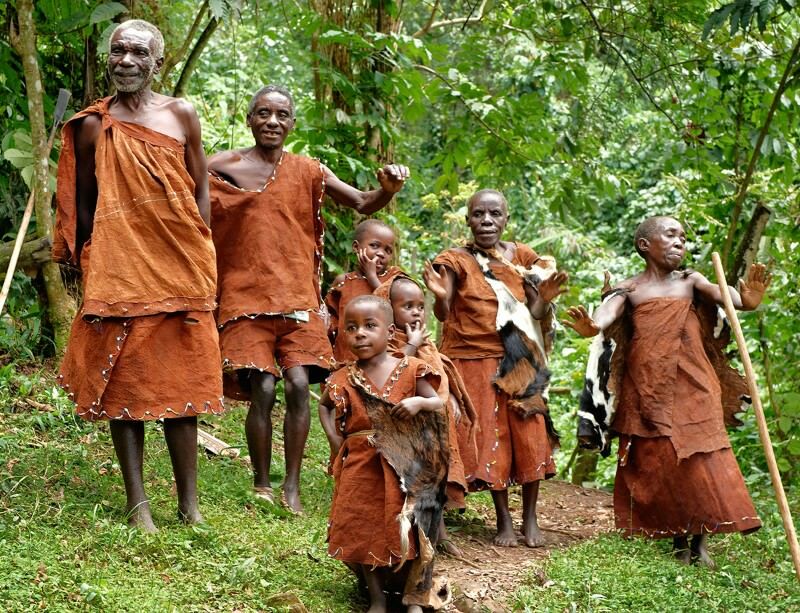 They may simply be shorter than neighboring peoples because they have lived in the forest for generations. Unlike ethnic groups, the Pygmies do not share a common language or use languages of their own. Each Pygmy group uses the languages of its non-Pygmy neighbors. The four main Pygmy groups are the Aka or BaBinga of Congo (Brazzaville), Gabon, and the Central African Republic; the Mbuti of the Ituri forest in Congo (Kinshasa); the Twa of Rwanda and Burundi; and the Gesere, who live near Lake Kivu, between Rwanda and Congo (Kinshasa). There is no single Pygmy society or culture. These people live in small bands that do not have chiefs or other political heads. Most bands are isolated from other Pygmies and are linked to local farming peoples, with whom they trade. The Pygmies exchange forest products such as game or honey for grain, iron, and salt, and sometimes they provide hunters and soldiers to neighboring chiefs. Traditionally Pygmies have been nomads. However, in some regions, the destruction of their environment by mining, logging, and farm expansion now threatens their ability to live off the forest. In addition, some governments have policies to encourage Pygmies to settle down and become farmers.